Among all groups which animated the French Cold Wave and Industrial scene of the 80s, Clair Obscur is certainly one of those which radiated furthest outside the boundaries of France. Several of their records have been published by British labels like All the Madmen (the live The Pilgrim’s Progress, 1986) or Cathexis Recordings (the 12" single Smurf in the Gulag, the same year), and one of their act of glory is to be part of the compilation From Torture To Conscience of the mythical label N.E.R. alongside with Current 93, In The Nursery or Death In June (1984). From Killing Joke to The Nits, from Le Cirque d’Hiver de Paris (1982) to the Wiener Festwochen (1991), the bands with which they played, and the venues and places that they performed are a fantastic testimony to the richness of this group which is so difficult to classify. Founded in Creil in 1981 by Thierry Damerval (bass guitar), Christophe (vocals) et Nicolas Demarthe (guitar), Clair Obscur drew immediately attention with a home made audio tape (re-released on the album Play), a 7" single magnificently designed (Santa Maria) and several 12" singles. From the most tribal cold wave to chamber music, from industrial music to dance music (unless these two are synonymous), their musical approach is eminently atmospheric and embraces a surprising variety of styles, giving birth to iconoclastic scenic transcriptions. By recreating a domestic place on stage or by organizing a fake TV game, Clair Obscur explore universes close to theatre or performance, which can be found in In Out, published in 1988 on V.I.S.A. with the help of France Culture. After the releases of the albums Sans titre, 1992, Rock (1994) and Nulle Aide… (recorded under the name CO2, for "Clair Obscur 2nd Generation", in 1999), the end of the 90s saw the group hibernate. Christophe Demarthe mainly worked on his project Cocoon, an ambitious multimedia work released on Optical Sound. Since March 2004, Clair Obscur has been reactivated by Nicolas and Christophe Demarthe, and their albums Play and In Out (...) re-released by the label Infrastition. *David Sanson is a journalist and a musician. 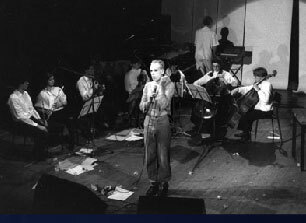 The text above is an excerpt of the booklet of the CD compilation "Echo Locatione, on the French scene of the 80's, published by Optical Sound in 2005.